The compact Mutoh ValueJet 1624WX printer is ideal for every day sublimation printing. The printer is fit for both startup and established businesses wanting to extend their product portfolio. 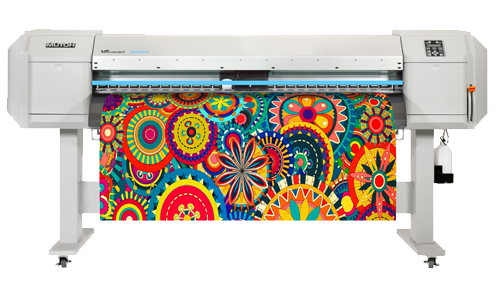 Mutoh ValueJet 1624WX prints on typical 95 g/m² – 100 g/m² dye sublimation transfer papers, making transfer onto all possible flexible and rigid polyester materials possible. Using dye and pigmented inks, the Mutoh ValueJet 1624WX printer is also suited for the production of high quality graphics for indoor and short term outdoor use : e.g. large format reproductions of portrait photographs, fine art reproductions, proofs of packaging designs, hard proofs of press print work, prints with very strict colour requirements.